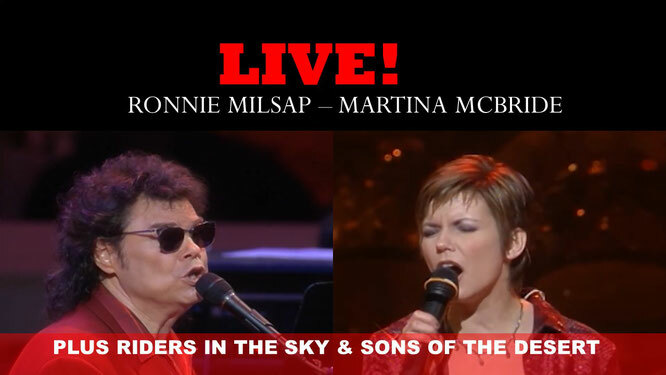 Ronnie Milsap, Martina McBride, Riders in The Sky & Sons Of The Desert Live! Full Show! - Newhillbilly website. 100% American Roots Music. Ronnie Lee Milsap (born January 16, 1943) is an American country music singer and pianist. He was one of country music's most popular and influential performers of the 1970s and 1980s. He became one of the most successful and versatile country "crossover" singers of his time, appealing to both country and pop music markets with hit songs that incorporated pop, R&B, and rock and roll elements. His biggest crossover hits include "It Was Almost Like a Song", "Smoky Mountain Rain", "(There's) No Gettin' Over Me", "I Wouldn't Have Missed It for the World", "Any Day Now", and "Stranger in My House". He is credited with six Grammy Awards and forty No. 1 country hits, third to George Strait and Conway Twitty. He was selected for induction into the Country Music Hall of Fame in 2014. Sons of the Desert was an American country music band founded in 1989 in Waco, Texas Original members of the band included, Brothers Jim and Brett Beavers, Troy Von Haefan and Brian Westrum (drums) Drew Womack (lead vocals, rhythm guitar) and Tim Womack (lead guitar, background vocals), along with Scott Saunders (keyboards), Doug Virden (bass guitar, background vocals) joined the band as the original band members left to pursue other musical careers. The band released Whatever Comes First for Epic Records Nashville in 1997, and recorded a second album for Epic which was not released. Change followed in 2000. Counting two singles from the unreleased album, Sons of the Desert charted eight times on the Billboard Hot Country Songs charts, including the top ten hit "Whatever Comes First"; they were also guest vocalists on Lee Ann Womack's 2000 hit "I Hope You Dance" and Ty Herndon's "It Must Be Love", both of which reached No. 1 on that chart. Following the band's disestablishment, Drew Womack became a solo artist.